For other uses, see Assam (disambiguation). Assam (/əˈsɑːm/ ( listen)) is a state in India, situated south of the eastern Himalayas along the Brahmaputra and Barak River valleys. Assam covers an area of 78,438 km2 (30,285 sq mi). 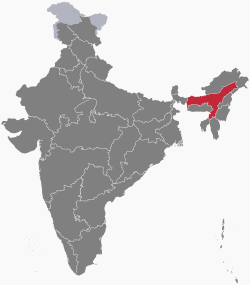 The state is bordered by Bhutan and Arunachal Pradesh to the north; Nagaland and Manipur to the east; Meghalaya, Tripura, Mizoram and Bangladesh to the south; and West Bengal to the west via the Siliguri Corridor, a 22 kilometres (14 mi) strip of land that connects the state to the rest of India. Myanmar lies in about 1 hour distance connected to the easternmost part of Assam through the Ledo Road. Academic complex of IIT Guwahati, Ahom Raja Palace, Kamakhya Temple, Rang Ghar, Kolia Bhomora Setu, Kaziranga Rhino and Sivasagar Sivadol. Anthem: "O Mur Apunar Desh"
The indigenous people traditionally include ethnic groups like Tai Ahom people, Tai Khamti people, Tai Turung people, Tai Aiton people, Tai Phake, Koch Rajbongshi, Misings, Sonowal Kachari, Rabha, Biate, Chutia, Kalitas, Meitei, Keot (Kaibarta), Bodo Kachari, Tea tribes, Tiwa, Mech Kachari, Thengal-Kacharis, Sarania Kacharis, Deorii, Dimasa Kachari, Hmar, Doms/Nadiyals, Assamese Brahmins (including Ganaks), Assamese Muslims (particularly Syeds, Goria, Moria, Deshi communities), Assamese Sikhs, and Assamese Christians speaking Assamese or any other tribal dialect of Assam as their mother tongue. The precise etymology of the modern anglicised word "Assam" is ambiguous. In the classical period and up to the 12th century the region east of the Karatoya river, largely congruent to present-day Assam, was called Kamarupa, and alternatively, Pragjyotisha. In medieval times the Mughals used Asham (eastern Assam) and Kamrup (western Assam), and during British colonialism, the English used Assam. Though many authors have associated the name with the 13th century Shan invaders the precise origin of the name is not clear. It was suggested by some that the Sanskrit word Asama ("unequalled", "peerless", etc.) was the root, which has been rejected by Kakati, and more recent authors have concurred that it is a latter-day Sanskritization of a native name. Among possible origins are Tai (A-Cham) and Bodo (Ha-Sam). Assam and adjoining regions have evidences of human settlements from all the periods of the Stone ages. The hills at the height of 1,500–2,000 feet (460 to 615 m) were popular habitats probably due to availability of exposed dolerite basalt, useful for tool-making. According to a late text, Kalika Purana (c. 9th–10th century AD), the earliest ruler of Assam was Mahiranga Danav of the Danava dynasty, which was removed by Naraka who established the Naraka dynasty. The last of these rulers, also Naraka, was slain by Krishna. Naraka's son Bhagadatta became the king, who (it is mentioned in the Mahabharata) fought for the Kauravas in the battle of Kurukshetra with an army of kiratas, chinas and dwellers of the eastern coast. At the same time towards east in central Assam, Asura Kingdom was ruled by indigenous Bodo-Kachari line of kings of Mariachi dynasty. Ambari site in Gwahati has revealed shunga Kushana era artifacts including flight of stairs and a water tank which may date from 1st century BC and maybe 2000 years old, experts speculate that Ambari was another significant find is roman era Roman Roulette Pottery from the 2nd century BC.Samudragupta's 4th century Allahabad pillar inscription mentions Kamarupa (Western Assam) and Davaka (Central Assam) as frontier kingdoms of the Gupta Empire. Assam and much of North East India were vassal states to the Mauryan, Shunga and Gupta Empire. Davaka was later absorbed by Kamarupa, which grew into a large kingdom that spanned from Karatoya river to near present Sadiya and covered the entire Brahmaputra valley, North Bengal, parts of Bangladesh and, at times Purnea and parts of West Bengal. The kingdom was ruled by three dynasties; the Varmanas (c. 350–650 CE), the Mlechchha dynasty (c.655–900 CE) and the Kamarupa-Palas (c. 900–1100 CE), from their capitals in present-day Guwahati (Pragjyotishpura), Tezpur (Haruppeswara) and North Gauhati (Durjaya) respectively. All three dynasties claimed descent from Narakasura. In the reign of the Varman king, Bhaskaravarman (c. 600–650 AD), the Chinese traveller Xuanzang visited the region and recorded his travels. Later, after weakening and disintegration (after the Kamarupa-Palas), the Kamarupa tradition was extended to c. 1255 AD by the Lunar I (c. 1120–1185 AD) and Lunar II (c. 1155–1255 AD) dynasties. Three later dynasties were the Chutiya, the Ahoms and the Koch. The Ahoms, a Tai group, ruled Upper Assam The Shans built their kingdom and consolidated their power in Eastern Assam with the modern town of Sibsagar as their capital. Until the early 1500s, the Ahoms ruled a small kingdom in Sibsagar district and suddenly expanded during King Suhungmung's rule taking advantage of weakening rule of Chutia and Dimasa kingdoms. By 1681, the whole tract down to the border of the modern district of Goalpara came permanently under their sway. Ahoms ruled for nearly 600 years (1228–1826 AD) with major expansions in the early 16th century at the cost of Chutia and Dimasa Kachari kingdoms. Since c. the 13th century AD, the nerve centre of Ahom polity was upper Assam; the kingdom was gradually extended to the Karatoya River in the 17th or 18th century. It was at its zenith during the reign of Sukhrungphaa or Sworgodeu Rudra Sinha (c. 1696–1714 AD). The Chutiya rulers (1187–1673 AD), a Bodo-Kachari group by origin, held the regions on both the banks of Brahmaputra with its domain in the area eastwards from Vishwanath (north bank) and Buridihing (south bank), in Upper Assam and in the state of Arunachal Pradesh. It was partially annexed in the early 1500s by the Ahoms, finally getting absorbed in 1673 AD. The rivalry between the Chutiyas and Ahoms for the supremacy of eastern Assam led to a series of battles between them from the early 16th century until the start of the 17th century, which saw great loss of men and money. The Koch, another Bodo-Kachari dynasty, established sovereignty in c. 1510 AD. The Koch kingdom in Western Assam and present North Bengal was at its zenith in the early reign of Nara Narayan (c. 1540–1587 AD). It split into two in c. 1581 AD, the western part as a Moghul vassal and the eastern as an Ahom satellite state. Later, in 1682, Koch Hajo was entirely annexed by the Ahoms. The Ahom Kingdom, c. 1826. Kareng ghar, the palace of the Ahom kings. Chutia kingdom: Coat of Arms. Chutia Royal Palace Bhismaknagar ruins. Koch kingdom: Coat of Arms. Among other dynasties, the Dimasa Kacharis (13th century-1854 AD) ruled from Dikhow River to central and southern Assam and had their capital at Dimapur. With expansion of Ahom kingdom, by the early 17th century, the Chutiya areas were annexed and since c. 1536 AD the Kacharis remained only in Cachar and North Cachar, and more as an Ahom ally than a competing force. First Ahom king Chao-lung Siu-ka-phaa. The last Chutia queen Sadhani. The Statue of Koch king Jagadipendra Narayan. Despite numerous invasions, mostly by the Muslim rulers, no western power ruled Assam until the arrival of the British. Though the Mughals made seventeen attempts to invade, they were never successful. The most successful invader Mir Jumla, a governor of Aurangzeb, briefly occupied Garhgaon (c. 1662–63 AD), the then capital, but found it difficult to prevent guerrilla attacks on his forces, forcing them to leave. The decisive victory of the Assamese led by general Lachit Borphukan on the Mughals, then under command of Raja Ram Singha, at Saraighat in 1671 almost ended Mughal ambitions in this region. The Mughals were finally expelled from Lower Assam during the reign of Gadadhar Singha in 1682 AD. 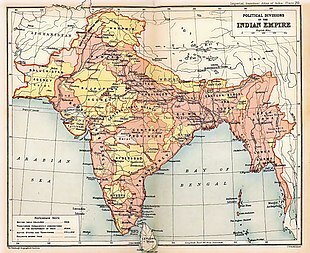 A map of the British Indian Empire in 1909 during the partition of Bengal (1905–1911), showing British India in two shades of pink (coral and pale) and the princely states in yellow. The Assam Province (initially as the Province of Eastern Bengal and Assam) can be seen towards the north-eastern side of India. The discovery of Camellia sinensis in 1834 in Assam was followed by testing in 1836–37 in London. The British allowed companies to rent land from 1839 onwards. Thereafter tea plantations mushroomed in Eastern Assam, where the soil and the climate were most suitable. Problems with the imported labourers from China and hostility from native Assamese resulted in the migration of forced labourers from central and eastern parts of India. After initial trial and error with planting the Chinese and the Assamese-Chinese hybrid varieties, the planters later accepted the local Camellia assamica as the most suitable variety for Assam. By the 1850s, the industry started seeing some profits. The industry saw initial growth, when in 1861, investors were allowed to own land in Assam and it saw substantial progress with invention of new technologies and machinery for preparing processed tea during the 1870s. Despite the commercial success, tea labourers continued to be exploited,[clarification needed] working and living under poor conditions. [clarification needed] Fearful of greater government interference, the tea growers formed the Indian Tea Association in 1888 to lobby to retain the status quo. The organisation was successful in this, but even after India's independence, conditions of the labourers have improved very little. In the later part of the 18th century, religious tensions and atrocities by the nobles led to the Moamoria rebellion (1769–1805), resulting in tremendous casualties of lives and property. The rebellion was suppressed but the kingdom was severely weakened by the civil war. Political rivalry between Prime Minister Purnananda Burhagohain and Badan Chandra Borphukan, the Ahom Viceroy of Western Assam, led to an invitation to the Burmese by the latter, in turn leading to three successive Burmese invasions of Assam. 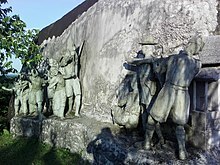 The reigning monarch Chandrakanta Singha tried to check the Burmese invaders but he was defeated after fierce resistance. A reign of terror was unleashed by the Burmese on the Assamese people, who fled to neighbouring kingdoms and British-ruled Bengal. The Burmese reached the East India Company's borders, and the First Anglo-Burmese War ensued in 1824. The war ended under the Treaty of Yandabo in 1826, with the Company taking control of Western Assam and installing Purandar Singha as king of Upper Assam in 1833. The arrangement lasted till 1838 and thereafter the British gradually annexed the entire region. Initially Assam was made a part of the Bengal Presidency, then in 1906 it was made a part of Eastern Bengal and Assam province, and in 1912 it was reconstituted into a chief commissioners' province. In 1913, a legislative council and, in 1937, the Assam Legislative Assembly, were formed in Shillong, the erstwhile capital of the region. The British tea planters imported labour from central India adding to the demographic canvas. The Assam territory was first separated from Bengal in 1874 as the 'North-East Frontier' non-regulation province, also known as the Assam Chief-Commissionership. 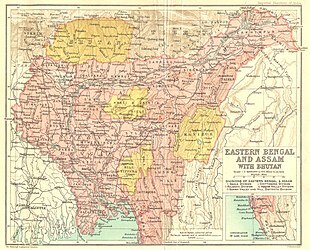 It was incorporated into the new province of Eastern Bengal and Assam in 1905 after the partition of Bengal (1905–1911) and re-established in 1912 as Assam Province . After a few initially unsuccessful attempts to gain independence for Assam during the 1850s, anti-colonial Assamese joined and actively supported the Indian National Congress against the British from the early 20th century, with Gopinath Bordoloi emerging as the preeminent nationalist leader in the Assam Congress. Bordoloi's major political rival in this time was Sir Saidullah, who was representing the Muslim League, and had the backing of the influential Muslim cleric Maulana Bhasani. The Assam Postage Circle was established by 1873 under the headship of the Deputy Post Master General. At the turn of the 20th century, British India consisted of eight provinces that were administered either by a governor or a lieutenant-governor. Assam Province was one among major eight provinces of British India. The table below shows the major original provinces during British India covering the Assam Province under the Administrative Office of the Chief Commissioner. With the partition of India in 1947, Assam became a constituent state of India. The Sylhet District of Assam (excluding the Karimganj subdivision) was given up to East Pakistan, which later became Bangladesh. Assam till the 1950s; The new states of Nagaland, Meghalaya and Mizoram formed in the 1960-70s. From Shillong, the capital of Assam was shifted to Dispur, now a part of Guwahati. After the Indo-China war in 1962, Arunachal Pradesh was also separated out. The government of India, which has the unilateral powers to change the borders of a state, divided Assam into several states beginning in 1970 within the borders of what was then Assam. In 1963, the Naga Hills district became the 16th state of India under the name of Nagaland. Part of Tuensang was added to Nagaland. In 1970, in response to the demands of the Khasi, Jaintia and Garo people of the Meghalaya Plateau, the districts embracing the Khasi Hills, Jaintia Hills, and Garo Hills were formed into an autonomous state within Assam; in 1972 this became a separate state under the name of Meghalaya. In 1972, Arunachal Pradesh (the North East Frontier Agency) and Mizoram (from the Mizo Hills in the south) were separated from Assam as union territories; both became states in 1986. Since the restructuring of Assam after independence, communal tensions and violence remain. Separatist groups began forming along ethnic lines, and demands for autonomy and sovereignty grew, resulting in the fragmentation of Assam. In 1961, the government of Assam passed legislation making use of the Assamese language compulsory. It was withdrawn later under pressure from Bengali speaking people in Cachar. In the 1980s the Brahmaputra valley saw a six-year Assam Agitation triggered by the discovery of a sudden rise in registered voters on electoral rolls. It tried to force the government to identify and deport foreigners illegally migrating from neighbouring Bangladesh and to provide constitutional, legislative, administrative and cultural safeguards for the indigenous Assamese majority, which they felt was under threat due to the increase of migration from Bangladesh. The agitation ended after an accord (Assam Accord 1985) between its leaders and the Union Government, which remained unimplemented, causing simmering discontent. The post 1970s experienced the growth of armed separatist groups such as the United Liberation Front of Asom (ULFA) and the National Democratic Front of Bodoland (NDFB). In November 1990, the Government of India deployed the Indian army, after which low-intensity military conflicts and political homicides have been continuing for more than a decade. In recent times, ethnically based militant groups have grown. Panchayati Raj Institutions have been applied[clarification needed] in Assam, after agitation of the communities due to the sluggish rate of development and general apathy of successive state governments towards Indigenous Assamese communities. Environs: Assam, dissected hills of the South Indian Plateau system and the Himalayas all around its north, north-east and east. A significant geographical aspect of Assam is that it contains three of six physiographic divisions of India – The Northern Himalayas (Eastern Hills), The Northern Plains (Brahmaputra plain) and Deccan Plateau (Karbi Anglong). As the Brahmaputra flows in Assam the climate here is cold and there is rainfall most of the month. Geomorphic studies conclude that the Brahmaputra, the life-line of Assam, is an antecedent river older than the Himalayas. The river with steep gorges and rapids in Arunachal Pradesh entering Assam, becomes a braided river (at times 10 mi/16 km wide) and with tributaries, creates a flood plain (Brahmaputra Valley: 50–60 mi/80–100 km wide, 600 mi/1000 km long). The hills of Karbi Anglong, North Cachar and those in and close to Guwahati (also Khasi-Garo Hills) now eroded and dissected are originally parts of the South Indian Plateau system. In the south, the Barak originating in the Barail Range (Assam-Nagaland border) flows through the Cachar district with a 25–30 miles (40–50 km) wide valley and enters Bangladesh with the name Surma River. With the "Tropical Monsoon Rainforest Climate", Assam is temperate (summer max. at 95–100 °F or 35–38 °C and winter min. at 43–46 °F or 6–8 °C) and experiences heavy rainfall and high humidity. The climate is characterised by heavy monsoon downpours reducing summer temperatures and affecting foggy nights and mornings in winters, frequent during the afternoons. Spring (Mar–Apr) and autumn (Sept–Oct) are usually pleasant with moderate rainfall and temperature. Assam's agriculture usually depends on the south-west monsoon rains. Every year, flooding from the Brahmaputra and other rivers deluges places in Assam. The water levels of the rivers rise because of rainfall resulting in the rivers overflowing their banks and engulfing nearby areas. Apart from houses and livestock being washed away by flood water, bridges, railway tracks and roads are also damaged by the calamity, which causes communication breakdown in many places. Fatalities are also caused by the natural disaster in many places of the State. Assam is one of the richest biodiversity zones in the world and consists of tropical rainforests, deciduous forests, riverine grasslands, bamboo orchards and numerous wetland ecosystems; Many are now protected as national parks and reserved forests. Assam has wildlife sanctuaries, the most prominent of which are two UNESCO World Heritage sites-the Kaziranga National Park, on the bank of the Brahmaputra River, and the Manas Wildlife Sanctuary, near the border with Bhutan. The Kaziranga is a refuge for the fast-disappearing Indian one-horned rhinoceros. The state is the last refuge for numerous other endangered and threatened species including the white-winged wood duck or deohanh, Bengal florican, black-breasted parrotbill, red-headed vulture, white-rumped vulture, greater adjutant, Jerdon's babbler, rufous-necked hornbill, Bengal tiger, Asian elephant, pygmy hog, gaur, wild water buffalo, Indian hog deer, hoolock gibbon, golden langur, capped langur, barasingha, Ganges river dolphin, Barca snakehead, Ganges shark, Burmese python, brahminy river turtle, black pond turtle, Asian forest tortoise, and Assam roofed turtle. Threatened species that are extinct in Assam include the gharial, a critically endangered fish-eating crocodilian, and the pink-headed duck (which may be extinct worldwide). For the state bird, the white-winged wood duck, Assam is a globally important area. [clarification needed] In addition to the above, there are three other National Parks in Assam namely Dibru Saikhowa National Park, Nameri National Park and the Orang National Park. Assam has conserved the one-horned Indian rhinoceros from near extinction, along with the pygmy hog, tiger and numerous species of birds, and it provides one of the last wild habitats for the Asian elephant. Kaziranga and Manas are both World Heritage Sites. The state contains Sal tree forests and forest products, much depleted from earlier times. A land of high rainfall, Assam displays greenery. The Brahmaputra River tributaries and oxbow lakes provide the region with hydro-geomorphic environment. The state has the largest population of the wild water buffalo in the world. The state has the highest diversity of birds in India with around 820 species. With subspecies the number is as high as 946. The mammal diversity in the state is around 190 species. Blooming of Kopou Orchid marks the beginning of festive season Bihu in Assam. Assam is remarkably rich in Orchid species and the Foxtail orchid is the state flower of Assam. The recently established Kaziranga National Orchid and Biodiversity Park boasts more than 500 of the estimated 1,314 orchid species found in India. Assam has petroleum, natural gas, coal, limestone and other minor minerals such as magnetic quartzite, kaolin, sillimanites, clay and feldspar. A small quantity of iron ore is available in western districts. Discovered in 1889, all the major petroleum-gas reserves are in Upper parts. A recent USGS estimate shows 399 million barrels (63,400,000 m3) of oil, 1,178 billion cubic feet (3.34×1010 m3) of gas and 67 million barrels (10,700,000 m3) of natural gas liquids in the Assam Geologic Province. The region is prone to natural disasters like annual floods and frequent mild earthquakes. Strong earthquakes were recorded in 1869, 1897, and 1950.
has been worked out by interpolation. The total population of Assam was 26.66 million with 4.91 million households in 2001. Higher population concentration was recorded in the districts of Kamrup, Nagaon, Sonitpur, Barpeta, Dhubri, Darrang, and Cachar. Assam's population was estimated at 28.67 million in 2006 and at 30.57 million in 2011 and is expected to reach 34.18 million by 2021 and 35.60 million by 2026. As per the 2011 census, the total population of Assam was 31,169,272. The total population of the state has increased from 26,638,407 to 31,169,272 in the last ten years with a growth rate of 16.93%. Of the 32 districts, eight districts registered a rise in the decadal population growth rate. Religious minority-dominated districts like Dhubri, Goalpara, Barpeta, Morigaon, Nagaon, and Hailakandi, recorded growth rates ranging from 20 per cent to 24 per cent during the last decade. Eastern Assamese districts, including Sivasagar and Jorhat, registered around 9 per cent population growth. These districts do not have any international border. In 2011, the literacy rate in the state was 73.18%. The male literacy rate was 78.81% and the female literacy rate was 67.27%. In 2001, the census had recorded literacy in Assam at 63.3% with male literacy at 71.3% and female at 54.6%. The urbanisation rate was recorded at 12.9%. The growth of population in Assam has increased since the middle decades of the 20th century. The population grew from 3.29 million in 1901 to 6.70 million in 1941. It increased to 14.63 million in 1971 and 22.41 million in 1991. The growth in the western and southern districts was high primarily due to the influx of people from East Pakistan, now Bangladesh. The mistrust and clashes between Indigenous Assamese people and Bengali Muslims started as early as 1952, but is rooted in anti Bengali sentiments of the 1940s. At least 77 people died and 400,000 people was displaced in the 2012 Assam violence between indigenous Bodos and Bengali Muslims. The People of India project has studied 115 of the ethnic groups in Assam. 79 (69%) identify themselves regionally, 22 (19%) locally, and 3 trans-nationally. The earliest settlers were Austric, Dravidian followed by Tibeto-Burman, Indo-Aryan, and Tai–Kadai people. Forty-five languages are spoken by different communities, including three major language families: Austroasiatic (5), Sino-Tibetan (24) and Indo-European (12). Three of the spoken languages do not fall in these families. There is a high degree of bilingualism. According to the 2011 census, 61.67% were Hindus, 34.22% were Muslims. Christian minorities (3.7%) are found among the Scheduled Tribe and Castes population. The scheduled Tribe population in Assam is around 13%, of which Bodos account for 40%. The scheduled caste population is about 7% of which the JalKeot and Kaibarta combined account for about 35%. Other religions followed include Jainism (0.1%), Buddhism (0.2%), Sikhism (0.1%) and Animism (amongst Khamti, Phake, Aiton etc. communities). Many Hindus in Assam are followers of the Ekasarana Dharma sect of Hinduism, which gave rise to Namghar, designed to be simpler places of worship than traditional Hindu temples. Out of 32 districts of Assam, 9 are Muslim majority according to the 2011 census of India. The districts are Dhubri, Goalpara, Barpeta, Morigaon, Nagaon, Karimganj, Hailakandi, Darrang and Bongaigaon. Assamese and Bodo are the major indigenous and official languages while Bengali is the official language in the three districts in the Barak Valley where Sylheti is the most spoken indigenous language. Bengali although a significant portion of those who are recorded speaking Bengali in the census do not actually speak Bengali, but instead speak closely related languages normally treated as dialects of Bengali, like Sylheti and Rangpuri. According to the language census of 2011 in Assam, out of a total population of around 31 million, Assamese is spoken by around half that number: 15 million. Although the number of speakers is growing, the percentage of Assam's population who have it as a mother tongue has fallen slightly. The various Bengali dialects and closely related languages are spoken by around 9 million people in Assam, and the portion of the population that speaks these languages has grown slightly. Bodo is still the third most-spoken language. Traditionally, Assamese was the language of the common folk (of mixed origin – Austric, Dravidian, Tibeto-Burman, Prakrit) and Tai in the ancient Kamarupa kingdom and in the medieval kingdoms of Dimasa Kachari, Chutiya Kachari, Borahi Kachari, Ahom and Koch Kachari Kingdom of Kamatapur. Traces of the language are found in many poems by Luipa, Sarahapa, and others, in Charyapada (c. 7th–8th century AD). Modern dialects such as Kamrupi and Goalpariya are remnants of this language. Moreover, Assamese in its traditional form was used by the ethno-cultural groups in the region as lingua-franca, which spread during the stronger kingdoms and was required for economic integration. Localised forms of the language still exist in Nagaland and Arunachal Pradesh. The form used in upper Assam was enriched by the advent of Tai-Shans in the 13th century. Linguistically modern Assamese traces its roots to the version developed by the American Missionaries based on the local form used near Sivasagar (Xiwôxagôr) district. Assamese (Ôxômiya) is a rich language due to its hybrid nature and unique characteristics of pronunciation and softness. Assamese literature is also one of the richest. The word Dimasa etymologically translates to "Son of the big river " (Di- Water, ma- suffix for great, sa-sons), the river being the mighty Brahmaputra. The Dimasa word "Di" for water forms the root word for many of the major rivers of Assam and the North East India like Dikrang which means green river, Dikhow which means "fetched water", Diyung (huge river) etc. The Brahmaputra River is known as Dilao (long river) among the Dimasas. Many of the towns and cities in Assam and Nagaland derived their names from Dimasa words. For example, Dimapur (a capital of Dimasa Kachari Kingdom), Dispur, Hojai, Diphu and Khaspur. Bodo is an ancient language of Assam. Spatial distribution patterns of the ethno-cultural groups, cultural traits and the phenomenon of naming all the major rivers in the North East Region with Bodo-Kachari words (e.g. Dihing, Dibru, Dihong, D/Tista, Dikrai, etc.) reveal that it was the most important language in the ancient times. Bodo is now spoken largely in the Western Assam (BTAD). After years of neglect, now Bodo language is getting attention and its literature is developing. Other native languages of Tibeto-Burman origin and related to Bodo-Kachari are Deori, Mising, Karbi, Rabha, and Tiwa. Kukish is another native language of Assam belonging to the Tibeto-Burman group. However it does not belong to the Greater Kachari Family. There are approximately 564,000 Nepali speakers spread all over the state forming about 2.12% of Assam's total population according to 2001 census. There are speakers of Tai languages in Assam. A total of six Tai language were spoken in Assam. Two are now extinct. Assam has Governor Jagdish Mukhi as the head of the state, the unicameral Assam Legislative Assembly of 126 members, and a government led by the Chief Minister of Assam. The state is divided into five regional divisions. As of June 2016[update], the state has 33 administrative districts. On 15 August 2015, five new districts were formed in addition to former 27 districts. The five new districts are Biswanath (carved out of Sonitpur), Charaideo (of Sivasagar), Hojai (of Nagaon), South Salmara-Mankachar (of Dhubri) and West Karbi Anglong (of Karbi Anglong). On 27 June 2016, Majuli declared as district (1st river island district of India). These districts are further sub-divided into 54 "Sub-divisions" or Mahakuma. Every district is administered from a district headquarters with the office of the Deputy Commissioner, District Magistrate, Office of the District Panchayat and usually with a district court. The districts are delineated on the basis of the features such as the rivers, hills, forests, etc. and majority of the newly constituted districts are sub-divisions of the earlier districts. The local governance system is organised under the jila-parishad (District Panchayat) for a district, panchayat for group of or individual rural areas and under the urban local bodies for the towns and cities. There are now 2489 village panchayats covering 26247 villages in Assam. The 'town-committee' or nagar-somiti for small towns, 'municipal board' or pouro-sobha for medium towns and municipal corporation or pouro-nigom for the cities consist of the urban local bodies. For the revenue purposes, the districts are divided into revenue circles and mouzas; for the development projects, the districts are divided into 219 'development-blocks' and for law and order these are divided into 206 police stations or thana. As on 19 May 2016, BJP under the leadership of Sarbananda Sonowal won the Assembly elections, thus forming the first BJP led government in Assam. Guwahati is the largest metropolitan area and urban conglomeration administered under the highest form of urban local body – Guwahati Municipal Corporation in Assam. The Corporation administers an area of 216.79 km2. All other urban centres are managed under Municipal Boards. Guwahati, the first township of Assam. Establishment of Guwahati Municipal Corporation. Dibrugarh, the second township of Assam. Formation of Goalpara Municipality, 1875. Formation of Dhubri Municipality, 1883. Formation of Nagaon Municipality, 1893. Formation of Tezpur Municipality, 1894. Formation of Jorhat Municipality, 1909. Formation of Golaghat Municipality, 1920. Formation of Silchar Municipality, 1922. †Tier – I: a big city with an urban conglomeration (in the true sense) administered by a Municipal Corporation. Tier – II: a medium–sized city for an urban agglomeration administered by a Municipal Board. Tier – III: a small town, larger than a township with a sizeable human settlement. ↑Upgraded to the next highest form of civic body. Jointly shared with the other urban centre. ^1 and ^2 Shared with Guwahati. ^3 Shared with Tezpur. ^4 Shared with Jorhat. The state has three autonomous councils. Bodoland Autonomous Territorial Council, Karbi Anglong Autonomous Council and Dima Hasao Autonomous Council. The state has further more six statutory autonomous council - Tiwashong Autonomous Council, Jagiroad for ethnic Tiwa Kachari also known as Lalung, Rabha Hasong Autonomous Council, Dudhnoi for ethnic Rabha Kachari, Mishing Autonomous Council, Dhemaji for Mishings a Tani Tribe, Sonowal Kachari Autonomous Council, Dibrugarh, Thengal Kachari Autonomous Council, Titabar and Deori Autonomous Council, Lakhimpur for ethnic Deori Kachari. Assam schools are run by the Indian government, government of Assam or by private organisations. Medium of instruction is mainly in Assamese, English or Bengali. Most of the schools follow the state's examination board which is called the Secondary Education Board of Assam. Almost all private schools follow the Central Board for Secondary Education (CBSE), Indian Certificate of Secondary Education (ICSE) and Indian School Certificate (ISC) syllabuses. Assamese language is the main medium in educational institutions but Bengali language is also taught as a major Indian language. In Guwahati and Digboi, many Jr. basic School and Jr. high School are Nepali linguistic and all the teachers are British Gorkha. Nepali is included by Assam State Secondary Board, Assam Higher Secondary Education Council and Gauhati University in their HSLC, higher secondary and graduation level respectively. In some junior basic and higher secondary schools and colleges, Nepali language speaking British Gorkha teachers and lecturers are appointed. The capital, Dispur, contains institutions of higher education for students of the north-eastern region. Cotton College, Guwahati, dates back to the 19th century. Assam has several institutions for tertiary education and research. Jorhat Engineering College in Jorhat. Assam's economy is based on agriculture and oil. Assam produces more than half of India's tea. The Assam-Arakan basin holds about a quarter of the country's oil reserves, and produces about 12% of its total petroleum. According to the recent estimates, Assam's per capita GDP is ₹6,157 at constant prices (1993–94) and ₹10,198 at current prices; almost 40% lower than that in India. According to the recent estimates, per capita income in Assam has reached ₹6756 (1993–94 constant prices) in 2004–05, which is still much lower than India's. The economy of Assam today represents a unique juxtaposition of backwardness amidst plenty. Despite its rich natural resources, and supplying of up to 25% of India's petroleum needs, Assam's growth rate has not kept pace with that of India; the difference has increased rapidly since the 1970s. The Indian economy grew at 6% per annum over the period of 1981 to 2000; the growth rate of Assam was only 3.3%. In the Sixth Plan period, Assam experienced a negative growth rate of 3.78% when India's was positive at 6%. In the post-liberalised era (after 1991), the difference widened further. According to recent analysis, Assam's economy is showing signs of improvement. In 2001–02, the economy grew (at 1993–94 constant prices) at 4.5%, falling to 3.4% in the next financial year. During 2003–04 and 2004–05, the economy grew (at 1993–94 constant prices) at 5.5% and 5.3% respectively. The advanced estimates placed the growth rate for 2005–06 at above 6%. Assam's GDP in 2004 is estimated at $13 billion in current prices. Sectoral analysis again exhibits a dismal picture. The average annual growth rate of agriculture, which was 2.6% per annum over the 1980s, has fallen to 1.6% in the 1990s. The manufacturing sector showed some improvement in the 1990s with a growth rate of 3.4% per annum than 2.4% in the 1980s. For the past five decades, the tertiary sector has registered the highest growth rates of the other sectors, which even has slowed down in the 1990s than in the 1980s. Unemployment is one of the major problems of Assam which can be attributed to overpopulation, and a faulty education system. Every year, large numbers of students obtain higher academic degrees but because of non-availability of proportional vacancies, most of these students remain unemployed. A number of employers hire over-qualified or efficient, but under-certified, candidates, or candidates with narrowly defined qualifications. The problem is exacerbated by the growth in the number of technical institutes in Assam which increases the unemployed community of the State. Many job-seekers are eligible for jobs in sectors like Railways and Oil India but don't get these jobs because of the appointment of candidates from outside of Assam to these posts. The reluctance on the part of the departments concerned to advertise vacancies in vernacular language has also made matters worse for local unemployed youths particularly for the job-seekers of Grade C and D vacancies. Reduction of the unemployed has been threatened by illegal immigration from Bangladesh. This has increased the workforce without a commensurate increase in jobs. Immigrants compete with local workers for jobs at lower wages, particularly in construction, domestics, Rickshaw-pullers, and vegetable sellers. The government has been identifying (via NRC) and deporting illegal immigrants. Continued immigration is exceeding deportation. In Assam among all the productive sectors, agriculture makes the highest contribution to its domestic sectors, accounting for more than a third of Assam's income and employs 69% of workforce. Assam's biggest contribution to the world is Assam tea. It has its own variety, Camellia sinensis var. assamica. The state produces rice, rapeseed, mustard seed, jute, potato, sweet potato, banana, papaya, areca nut, sugarcane and turmeric. Assamese women busy in planting paddy seedlings in their agricultural field in Pahukata village in Nagaon district of Assam, India . Assam's agriculture is yet to experience modernisation in a real sense. With implications for food security, per capita food grain production has declined in the past five decades. Productivity has increased marginally, but is still low compared to highly productive regions. For instance, the yield of rice (staple food of Assam) was just 1531 kg per hectare against India's 1927 kg per hectare in 2000–01 (which itself is much lower than Egypt's 9283, US's 7279, South Korea's 6838, Japan's 6635 and China's 6131 kg per hectare in 2001). On the other hand, after having strong domestic demand, and with 1.5 million hectares of inland water bodies, numerous rivers and 165 varieties of fishes, fishing is still in its traditional form and production is not self-sufficient. Flood in Assam greatly affects the farmers and the families dependent on agriculture because of large-scale damage of agricultural fields and crops by flood water. Every year, flooding from the Brahmaputra and other rivers deluges places in Assam. The water levels of the rivers rise because of rainfall resulting in the rivers overflowing their banks and engulfing nearby areas. Apart from houses and livestock being washed away by flood water, bridges, railway tracks and roads are also damaged by the calamity, which causes communication breakdown in many places. Fatalities are also caused by the natural disaster in many places of the State. Assam's proximity to some neighbouring countries such as Bangladesh, Nepal and Bhutan, benefits its trade. The major Border checkpoints through which border trade flows to Bangladesh from Assam are :- Sutarkandi (Karimganj), Dhubri, Mankachar (Dhubri) and Golokanj. To facilitate border trade with Bangladesh, Border Trade Centres have been developed at Sutarkandi and Mankachar. It has been proposed in the 11th five-year plan[clarification needed] to set up two more Border Trade Center, one at Ledo connecting China and other at Darrang connecting Bhutan. There are several Land Custom Stations (LCS) in the state bordering Bangladesh and Bhutan to facilitate border trade. Although, the region in the eastern periphery of India is landlocked and is linked to the mainland by the narrow Siliguri Corridor (or the Chicken's Neck) improved transport infrastructure in all the three modes — rail, road and air — and developing urban infrastructure in the cities and towns of Assam are giving a boost to the entire industrial scene. The Lokpriya Gopinath Bordoloi International Airport at Guwahati, with international flights to Bangkok and Singapore offered by Druk Air of Bhutan, was the 12th busiest airport of India in 2012. The cities of Guwahati in the West and Dibrugarh in the East with good rail, road and air connectivity are the two important nerve centres of Assam, to be selected by Asian Development Bank for providing $200 million for improvement of urban infrastructure. Assam is a producer of crude oil and it accounts for about 15% of India's crude output, exploited by the Assam Oil Company Ltd., and natural gas in India and is the second place in the world (after Titusville in the United States) where petroleum was discovered. Asia's first successful mechanically drilled oil well was drilled in Makum way back in 1867. Most of the oilfields are located in the Eastern Assam region. Assam has four oil refineries in Digboi (Asia's first and world's second refinery), Guwahati, Bongaigaon and Numaligarh and with a total capacity of 7 million metric tonnes (7.7 million short tons) per annum. Asia's first refinery was set up at Digboi and discoverer of Digboi oilfield was the Assam Railways & Trading Company Limited (AR&T Co. Ltd.), a registered company of London in 1881. One of the biggest public sector oil company of the country Oil India Ltd. has its plant and headquarters at Duliajan. There are several other industries, including a chemical fertiliser plant at Namrup, petrochemical industries at Namrup and Bongaigaon, Paper mills at Jagiroad, Hindustan Paper Corporation Ltd. Township Area Panchgram and Jogighopa, sugar mills at Barua Bamun Gaon, Chargola, Kampur, Cement plant at Bokajan and Badarpur, cosmetics plant of Hindustan Unilever (HUL) at Doom Dooma, etc. Moreover, there are other industries such as jute mill, textile and yarn mills, Assam silk, and silk mills. Many of these industries are facing loss and closure due to lack of infrastructure and improper management practices. Wildlife, cultural, and historical destinations have attracted visitors. Assimilation in the Kamarupa Kingdom for almost 700 years (under the Varmans for 300 years, Salastambhas and Palas for each 200 years). Establishment of the Chutiya dynasty in the 12th century in eastern Assam and assimilation for next 400 years. Establishment of the Ahom dynasty in the 13th century AD and assimilation for next 600 years. Assimilation in the Koch Kingdom (15th–16th century AD) of western Assam and Kachari Kingdom (12th–18th century AD) of central and southern Assam. Vaishnava Movement led by Srimanta Shankardeva (Xongkordeu) and its contribution and cultural changes. Vaishanava Movement, the 15th century religio-cultural movement under the leadership of great Srimanta Sankardeva (Sonkordeu) and his disciples have provided another dimension to Assamese culture. A renewed Hinduisation in local forms took place, which was initially greatly supported by the Koch and later by the Ahom Kingdoms. The resultant social institutions such as namghar and sattra (the Vaishnav Monasteries) have become part of Assamese way life. The movement contributed greatly towards language, literature and performing and fine arts. The modern culture was influenced by events in the British and the Post-British Era. The language was standardised by the American Baptist Missionaries such as Nathan Brown, Dr. Miles Bronson and local pundits such as Hemchandra Barua with the form available in the Sibsagar (Sivasagar) District (the ex-nerve centre of the Ahom Kingdom). Increasing efforts of standardisation in the 20th century alienated the localised forms present in different areas and with the less-assimilated ethno-cultural groups (many source-cultures). However, Assamese culture in its hybrid form and nature is one of the richest, still developing and in true sense is a 'cultural system' with sub-systems. Many source-cultures of Assamese cultural-system are still surviving either as sub-systems or as sister entities, e.g. the ; Bodo or Karbi or Mishing. It is important to keep the broader system closer to its roots and at the same time to focus on development of the sub-systems. Some of the common and unique cultural traits in the region are peoples' respect towards areca-nut and betel leaves, symbolic (gamosa, arnai, etc. ), traditional silk garments (e.g. mekhela chador, traditional dress of Assamese women) and towards forefathers and elderly. Moreover, great hospitality and bamboo culture are common. Symbolism is an ancient cultural practice in Assam and is still a very important part of Assamese way of life. Various elements are being used to represent beliefs, feelings, pride, identity, etc. Tamulpan, Xorai and Gamosa are three important symbolic elements in Assamese culture. Tamulpan (the areca nut and betel leaves) or guapan (gua from kwa) are considered along with the Gamosa (a typical woven cotton or silk cloth with embroidery) as the offers of devotion, respect and friendship. The Tamulpan-tradition is an ancient one and is being followed since time-immemorial with roots in the aboriginal Austric culture. Xorai is a traditionally manufactured bell-metal article of great respect and is used as a container-medium while performing respectful offers. Moreover, symbolically many ethno-cultural groups use specific clothes to portray respect and pride. There were many other symbolic elements and designs, but are now only found in literature, art, sculpture, architecture, etc. or in use today for only religious purposes. The typical designs of assamese-lion, dragon, flying-lionetc. were used for symbolising various purposes and occasions. The archaeological sites such as the Madan Kamdev (c. 9th–10th centuries AD) exhibits mass-scale use of lions, dragon-lions and many other figures of demons to show case power and prosperity. The Vaishnava monasteries and many other architectural sites of late medieval period display the use of lions and dragons for symbolic effects. There are diversified important traditional festivals in Assam. Bihu is the most important and common and celebrated all over Assam. It is the Assamese new year celebrated in April of the Gregorian calendar. Christmas is observed with great merriment by Christians of various denominations, including Catholics and Protestants, throughout Assam. Durga Puja, a festival introduced and popularised by Bengalis, is widely celebrated across the state. Muslims celebrate two Eids (Eid ul-Fitr and Eid al-Adha) with much eagerness all over Assam. Bihu is a series of three prominent festivals. Primarily a non-religious festival celebrated to mark the seasons and the significant points of a cultivator's life over a yearly cycle. Three Bihus, rongali or bohag, celebrated with the coming of spring and the beginning of the sowing season; kongali or kati, the barren bihu when the fields are lush but the barns are empty; and the bhogali or magh, the thanksgiving when the crops have been harvested and the barns are full. Bihu songs and Bihu dance are associated to rongali bihu. The day before the each bihu is known as 'uruka'. The first day of 'rongali bihu' is called 'Goru bihu' (the bihu of the cows), when the cows are taken to the nearby rivers or ponds to be bathed with special care. In recent times the form and nature of celebration has changed with the growth of urban centres. Bwisagu is one of the popular seasonal festivals of the Bodos. Bwisagu start of the new year or age. Baisagu is a Boro word which originated from the word "Baisa" which means year or age, ang "Agu" that means starting or start. Bushu Dima or simply Bushu is a major harvest festival of the Dimasa people. This festival is celebrated during the end of January. Officially 27 January has been declared as the day of Bushu Dima festival. The Dimasa people celebrate their festival by playing musical instruments- khram (a type of drum), muri ( a kind of huge long flute). The people dances to the different tunes called "murithai" and each dance has got its name, the prominent being the "Baidima" There are three types of Bushu celebrated among the Dimasas Jidap, Surem and Hangsou. Chavang Kut is a post harvesting festival of the Kuki people. The festival is celebrated on the 1st day of November every year. Hence, this particular day has been Officially declared as a Restricted Holiday by the Assam Govt. In the past, the celebration was primarily important in the religio-cultural sense. The rhythmic movements of the dances in the festival were inspired by animals, agricultural techniques and showed their relationship with ecology. Today, the celebration witnesses the shifting of stages and is revamped to suit new contexts and interpretations. The traditional dances which forms the core of the festival is now performed in the out-of-village settings and are staged in a secular public sphere. In Assam, the Kukis mainly reside in the two Autonomous districts of Dima Hasao and Karbi Anglong. Other few yearly celebrations are Doul Utsav of Barpeta, Brahmaputra Beach Festival, Guwahati, Kaziranga Elephant Festival, Kaziranga and Dehing Patkai Festival, Lekhapani, Karbi Youth Festival of Diphu and International Jatinga Festival, Jatinga can not be forgotten. Few yearly Mela's like Jonbeel Mela, began in the 15th century by the Ahom Kings, Ambubachi Mela, Guwahati etc. Lachit Divas' is celebrated to promote the ideals of Lachit Borphukan – the legendary general of Assam's history. Sarbananda Sonowal, the chief minister of Assam took part in the Lachit Divas celebration at the statue of Lachit Borphukan at Brahmaputra riverfront on 24 November 2017. He said, the first countrywide celebration of 'Lachit Divas' would take place in New Delhi followed by state capitals such as Hyderabad, Bangalore and Kolkata in a phased manner. Performing arts include: Ankia Naat (Onkeeya Naat), a traditional Vaishnav dance-drama (Bhaona) popular since the 15th century AD. It makes use of large masks of gods, goddesses, demons and animals and in between the plays a Sutradhar (Xutrodhar) continues to narrate the story. Besides Bihu dance and Huchory performed during the Bohag Bihu, dance forms of tribal minorities such as; Kushan nritra of Rajbongshi's, Bagurumba and Bordoicikhla dance of Bodos, Mishing Bihu, Banjar Kekan performed during Chomangkan by Karbis, Jhumair of Tea tribes are some of the major folk dances. Sattriya (Sotriya) dance related to Vaishnav tradition is a classical form of dance. Moreover, there are several other age-old dance-forms such as Barpeta's Bhortal Nritya, Deodhoni Nritya, Ojapali, Beula Dance, Ka Shad Inglong Kardom, Nimso Kerung, etc. The tradition of modern moving theatres is typical of Assam with immense popularity of many large theatre groups such as Kohinoor, Sankardev, Abahan, Bhagyadevi, Hengul, Brindabon, Itihas etc. The indigenous folk music has influenced the growth of a modern idiom, that finds expression in the music of artists like Jyoti Prasad Agarwala, Bishnuprasad Rabha, Parvati Prasad Baruwa, Bhupen Hazarika, Pratima Barua Pandey, Anima Choudhury, Luit Konwar Rudra Baruah, Jayanta Hazarika, Khagen Mahanta, Deepali Borthakur, Ganashilpi Dilip Sarma, Sudakshina Sarma among many others. Among the new generation, Zubeen Garg, Jitul Sonowal, Angaraag Mahanta and Joi Barua. There is an award given in the honour of Bishnuprasad Rabha for achievements in the cultural/music world of Assam by the State Government. Typically, an Assamese meal consists of many things such as bhat (rice) with dayl/ daly (lentils), masor jool (fish stew), mangxô (meat stew) and stir fried greens or herbs and vegetables. The two main characteristics of a traditional meal in Assam are khar (an Alkali, named after its main ingredient) and tenga (Preparations bearing a characteristically rich and tangy flavour). Khorika is the smoked or fire grilled meat eaten with meals. Commonly consumed varieties of meat include mutton, fowl, duck/goose, fish, pigeon, pork and beef (among Christian, Muslim and indigenous Assamese communities). Grasshoppers, locusts, silkworms, snails, eels, wild fowl, squab and other birds, venison are also eaten, albeit in moderation. Khorisa (fermented bamboo shoots) are used at times to flavour curries while they can also be preserved and made into pickles. Koldil (banana flower) and squash are also used in popular culinary preparations. A variety of different rice cultivars are grown and consumed in different ways, viz., roasted, ground, boiled or just soaked. Fish curries made of free range wild fish as well as Bôralí, rôu, illish, or sitôl are the most popular. Another favourite combination is luchi (fried flatbread), a curry which can be vegetarian or non-vegetarian. Many indigenous Assamese communities households still continue to brew their traditional alcoholic beverages; examples include: Laupani, Xaaj, Paniyo, Jou, Joumai, Hor, Apang, etc. Such beverages are served during traditional festivities. Declining them is considered socially offensive. The food is often served in bell metal dishes and platters like Kahi, Maihang and so on. Most literary works are written in Assamese although other local language such as Boro and Dimasa are also represented. In the 19th and 20th century, Assamese and other literature was modernised by authors including Lakshminath Bezbaroa, Birinchi Kumar Barua, Hem Barua, Dr. Mamoni Raisom Goswami, Bhabendra Nath Saikia, Birendra Kumar Bhattacharya, Hiren Bhattacharyya, Homen Borgohain, Bhabananda Deka, Rebati Mohan Dutta Choudhury, Mahim Bora, Lal Bahadur Chettri, Syed Abdul Malik, Surendranath Medhi, Hiren Gohain etc. The archaic Mauryan Stupas discovered in and around Goalpara district are the earliest examples (c. 300 BC to c. 100 AD) of ancient art and architectural works. The remains discovered in Daparvatiya (Doporboteeya) archaeological site with a beautiful doorframe in Tezpur are identified as the best examples of art works in ancient Assam with influence of Sarnath School of Art of the late Gupta period. Painting is an ancient tradition of Assam. Xuanzang (7th century AD) mentions that among the Kamarupa king Bhaskaravarma's gifts to Harshavardhana there were paintings and painted objects, some of which were on Assamese silk. Many of the manuscripts such as Hastividyarnava (A Treatise on Elephants), the Chitra Bhagawata and in the Gita Govinda from the Middle Ages bear excellent examples of traditional paintings. Assam has a rich tradition of crafts;, Cane and bamboo craft, bell metal and brass craft, silk and cotton weaving, toy and mask making, pottery and terracotta work, wood craft, jewellery making, and musical instruments making have remained as major traditions. Cane and bamboo craft provide the most commonly used utilities in daily life, ranging from household utilities, weaving accessories, fishing accessories, furniture, musical instruments, construction materials, etc. Utilities and symbolic articles such as Sorai and Bota made from bell metal and brass are found in every Assamese household. Hajo and Sarthebari (Sorthebaary) are the most important centres of traditional bell-metal and brass crafts. Assam is the home of several types of silks, the most prestigious are: Muga – the natural golden silk, Pat – a creamy-bright-silver coloured silk and Eri – a variety used for manufacturing warm clothes for winter. Apart from Sualkuchi (Xualkuchi), the centre for the traditional silk industry, in almost every parts of the Brahmaputra Valley, rural households produce silk and silk garments with excellent embroidery designs. Moreover, various ethno-cultural groups in Assam make different types of cotton garments with unique embroidery designs and wonderful colour combinations. Moreover, Assam possesses unique crafts of toy and mask making mostly concentrated in the Vaishnav Monasteries, pottery and terracotta work in Western Assam districts and wood craft, iron craft, jewellery, etc. in many places across the region. Print media include Assamese dailies Amar Asom, Asomiya Khobor, Asomiya Pratidin, Dainik Agradoot, Dainik Janambhumi, Dainik Asam, Gana Adhikar, Janasadharan and Niyomiya Barta. Asom Bani, Sadin and Bhal Khabar are Assamese weekly newspapers. English dailies of Assam include The Assam Tribune, The Sentinel, The Telegraph, The Times of India,The North East Times, Eastern Chronicle and The Hills Times. Thekar, in the Karbi language has the largest circulation of any daily from Karbi Anglong district. Bodosa has the highest circulation of any Bodo daily from BTC. Dainik Jugasankha is a Bengali daily with editions from Dibrugarh, Guwahati, Silchar and Kolkata. Dainik Samayik Prasanga, Dainik Prantojyoti, Dainik Janakantha and Nababarta Prasanga are other prominent Bengali dailies published in the Barak Valley towns of Karimganj and Silchar. Hindi dailies include Purvanchal Prahari, Pratah Khabar and Dainik Purvoday. Broadcasting stations of All India Radio have been established in five big cities: Dibrugarh, Guwahati, Kokrajhar, Silchar and Tezpur. Local news and music are the main priority for that station. Assam has three public service broadcasting service stations at Dibrugarh, Guwahati and Silchar. Guwahati is the headquarters of a number of electronic medias like Assam Talks, DY 365, News Live, News 18 Assam/North-East, Prag News and Pratidin Time. Outline of Assam – comprehensive topic guide listing articles about Assam. ^ Steinberg, S. (2016). The Statesman's Year-Book 1964-65: The One-Volume ENCYCLOPAEDIA of all nations. Springer. p. 412. ISBN 9780230270930. ^ "Assam Budget 2019-20" (PDF). Assam Finance Dept. Retrieved 15 March 2018. ^ "STATE WISE DATA" (PDF). rbi.org.in. Reserve Bank of India, New Delhi. Retrieved 17 February 2017. ^ "Report of the Commissioner for linguistic minorities: 52nd report (July 2014 to June 2015)" (PDF). Commissioner for Linguistic Minorities, Ministry of Minority Affairs, Government of India. pp. 58–59. Archived from the original (PDF) on 28 December 2017. Retrieved 16 February 2016. ^ "Meet the Axomiya Sikhs". The Tribune. Chandigarh. 24 March 2013. ^ Sukalpa Bhattacharjee, C Joshua Thomas,2013,Society, Representation and Textuality:The Critical Interface It deals with the expansion of the Mughal Empire in Bengal, Kamrup and Assam. ^ Satish Chandra (2005), Medieval India:Fro Sultanate to the Mughals Part – II They had support of many Hindu Rajas of Jessore, Kamrup (Western Assam), Cachar, Tippera, etc. ^ "The Assam Tribune Online". www.assamtribune.com. Retrieved 3 January 2019. ^ Deka, Prodyut Kumar (6 July 2017). Ambari. Educreation Publishing. ^ "Relics hold clue to missing history - Sunga-Kushana era terracotta artefacts may say if Guwahati existed before 7th century AD". www.telegraphindia.com. Retrieved 3 January 2019. ^ Tej Ram Sharma,1978, "Personal and geographical names in the Gupta inscriptions. (1.publ. 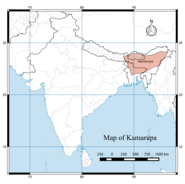 )", Page 254, Kamarupa consisted of the Western districts of the Brahmaputra valley which being the most powerful state. ^ Suresh Kant Sharma, Usha Sharma – 2005,"Discovery of North-East India: Geography, History, Culture, ... – Volume 3", Page 248, Davaka (Nowgong) and Kamarupa as separate and submissive friendly kingdoms. ^ The eastern border of Kamarupa is given by the temple of the goddess Tamreshvari (Pūrvāte Kāmarūpasya devī Dikkaravasini in Kalika Purana) near present-day Sadiya. "...the temple of the goddess Tameshwari (Dikkaravasini) is now located at modern Sadiya about 100 miles to the northeast of Sibsagar" (Sircar 1990, pp. 63–68). ^ Roy, Tirthankar (2012). India in the World Economy: From Antiquity to the Present. Cambridge University Press. p. 202. ISBN 978-1-107-00910-3. ^ Baruah, L.M. (1992). Lokopriya Gopinath Bordoloi, an Architect of Modern India. Gyan Publishing House. ISBN 81-212-0404-6. Retrieved 17 November 2013. ^ Nath, Sunil (2001). "The Secessionist Insurgency and the Freedom of Minds". www.satp.org. Institute for Conflict Management. Retrieved 24 January 2014. ^ Indian Philatelists Forum (4 June 2011). "Glimpses of Modern Indian Philately: INDIAN POSTAL CIRCLES". Modernindianphilately.blogspot.in. Retrieved 11 June 2014. ^ Bhubaneswar Bhattacharyya (1995). The troubled border: some facts about boundary disputes between Assam-Nagaland, Assam-Arunachal Pradesh, Assam-Meghalaya, and Assam-Mizoram. Lawyer's Book Stall. ^ a b Governor of Assam (8 November 1998). "Report on Illegal Migration into Assam". Archived from the original on 9 June 2007. Retrieved 26 May 2007. ^ "Guwahati's landscape to change with satellite towns, BRT systems". The Assam Tribune. Archived from the original on 3 November 2013. Retrieved 4 August 2013. ^ "Dibrugarh – Roing – Mayudia – Anini Tourist Circuit". Arunachal Tourism. Archived from the original on 6 April 2013. Retrieved 4 August 2013. ^ Purdue University. "The Köppen Classification of Climates". Archived from the original on 5 June 2007. Retrieved 25 May 2007. ^ a b "Assam Flood Toll Rises to 13". NDTV. 23 August 2015. Retrieved 25 August 2015. ^ a b "Flood situation in Assam worsens". Hindustan Times. 23 August 2015. Retrieved 25 August 2015. ^ Birdlife International, UK. "Indo-Gangetic Grasslands" (PDF). ^ Sharma, Pradip (April – June 2003), "An Overview on Wetlands in Assam" (PDF), ENVIS Assam, Assam Science Technology and Environment Council, 2: 7, archived from the original (PDF) on 20 May 2006. ^ World Heritage Centre, UNESCO. "World Heritage List". ^ ENVIS Assam (April – June 2003). "Endemic Orchids of Assam" (PDF). ENVIS Assam, Assam Science Technology and Environment Council. 2: 8. Archived from the original (PDF) on 20 May 2006. ^ a b NEDFi & NIC-Assam. "North East India Databank". Archived from the original on 18 April 2007. ^ a b Government of Assam 2002–03. "Statistics of Assam". Archived from the original on 7 June 2007. Retrieved 3 June 2007. ^ National Commission on Population, Census of India (2006). "Population Projections for India and States 2001–2026". Archived from the original on 14 May 2007. Retrieved 15 May 2007. ^ a b Government of Assam Census 2011. "onlineassam". Retrieved 6 June 2012. ^ cdpsindia. "centre for development and peace studies". ^ "Muslim-Bodo mistrust exists for many decades – The Times of India". Timesofindia.indiatimes.com. 24 July 2012. Retrieved 11 June 2014. ^ "Assam govt mulls arming Muslims in Bodo areas – The Times of India". Timesofindia.indiatimes.com. 5 May 2014. Retrieved 11 June 2014. ^ Andre, Aletta; Kumar, Abhimanyu (23 December 2016). "Protest poetry: Assam's Bengali Muslims take a stand". Aljazeera. Aljazeera. Retrieved 26 January 2017. ^ "Assam violence: Four more bodies found, toll rises to 77". IBN. 8 August 2012. Archived from the original on 26 January 2013. Retrieved 2 November 2013. ^ Harris, Gardiner (28 July 2012). "As Tensions in India Turn Deadly, Some Say Officials Ignored Warning Signs". The New York Times. ^ a b "Population by religion community – 2011". Census of India, 2012. The Registrar General & Census Commissioner, India. Archived from the original on 25 August 2015. ^ "Census 2011 data rekindles 'demographic invasion' fear in Assam". ^ "India's religions by numbers". 26 August 2015. Retrieved 5 August 2016 – via The Hindu. ^ "Bodos and their rights". ^ "Muslim majority districts in Assam up". ^ "Assam Muslim growth is higher in districts away from border". ^ "C-16 Population by Mother Tongue". www.censusindia.gov.in. Office of the Registrar General & Census Commissioner, India. Retrieved 30 July 2018. ^ "Sylheti". Ethnologue. Retrieved 12 March 2018. ^ Morey, Stephen. 2005. The Tai languages of Assam: a grammar and texts. Canberra: Pacific Linguistics. ^ "Govt announces 5 new districts". Assam Times. 15 August 2015. Retrieved 16 August 2015. ^ "Assam: Majuli becomes 1st river island district of India". Hindustan Times. Guwahati. 27 June 2016. Retrieved 28 June 2016. ^ Directorate of Information and Public Relations, Government of Assam. "Area of the National Parks and Wildlife Sanctuaries in Assam, 2002". Archived from the original on 6 October 2007. Retrieved 29 May 2006. ^ "North by Northeast: What explains BJP's stunning win in Assam?". 22 May 2016. Retrieved 5 August 2016. ^ "GMC Portal". Retrieved 5 August 2016. ^ Sharma, Anil Kumar (1 January 2007). "Quit India Movement In Assam". Mittal Publications. Retrieved 5 August 2016 – via Google Books. ^ Saikia, Dr Jugal (8 April 2016). "Economics Of Informal Milk Producing Units In Assam". Notion Press. Retrieved 5 August 2016 – via Google Books. ^ "History – GMC Portal". Retrieved 5 August 2016. ^ "Municipal Board". Retrieved 5 August 2016. ^ "Municipal Board-About Us". Retrieved 5 August 2016. ^ "Jorhat Municipal Board(JBM), Jorhat, Assam". Archived from the original on 27 March 2016. Retrieved 5 August 2016. ^ "AGP lists civic poll candidates". Retrieved 5 August 2016. ^ "Silchar Municipal Board (Silchar Municipality) Assam – Silchar Karimganj Hailakandi". Retrieved 5 August 2016. ^ "Don Bosco University – Azara – Guwahati – Welcome to Don Bosco University". Dbuniversity.ac.in. Retrieved 22 September 2012. ^ "Assam Down Town University". adtu.in. Retrieved 22 September 2012. ^ "Assam Women's University". Assam Women's University. Retrieved 7 August 2015. ^ "Bodoland University website". bodolanduniversity.org.in. Retrieved 22 September 2012. ^ "Dibrugarh University". Dibrugarh University. Retrieved 7 August 2015. ^ "Gauhati University". Gauhati University. Retrieved 7 August 2015. ^ "Kaziranga University". kazirangauniversity.in. Retrieved 22 September 2012. ^ "Tezpur University". Tezpur University. Retrieved 7 August 2015. ^ "Girijananda Chowdhury Institute of Management & Technology". Retrieved 5 August 2016. ^ "National Research Centre on Pig, (ICAR) in Guwahati". Retrieved 16 October 2014. ^ Indian Tea Association. "Tea Scenario". Archived from the original on 1 March 2015. Retrieved 19 April 2015. ^ U.S. Energy Information Administration. "India – Analysis". Retrieved 19 April 2015. ^ a b c Government of Assam. "Economic Survey of Assam 2005–2006 in NEDFi, Assam Profile, NER Databank". Archived from the original on 31 December 2008. Retrieved 6 June 2007. ^ Government of Assam. "2, Income, Employment and Poverty". Economic Survey of Assam 2001–2002 in Assam Human Development Report, 2003. p. 25. Archived from the original (PDF) on 20 February 2007. Retrieved 6 June 2007. ^ a b Government of Assam (2006). "Economic Survey of Assam 2004–2005 in NEDFi, Assam Profile, NER Databank". Retrieved 6 June 2007. ^ "Poor infrastructure, stringent policies bottleneck for Assam's growth". The Economic Times. 9 July 2015. Retrieved 25 August 2015. ^ "Panel for study of unemployment problem in Assam". Zee News. 26 October 2012. Retrieved 25 August 2015. ^ "The Assam Tribune". The Assam Tribune. 17 October 2013. Archived from the original on 23 September 2015. Retrieved 25 August 2015. ^ "The Assam Tribune". The Assam Tribune. 21 January 2014. Archived from the original on 23 September 2015. Retrieved 25 August 2015. ^ "Centre taking steps to check illegal immigration into Assam". The Economic Times. 5 August 2015. Retrieved 25 August 2015. ^ "Soon blueprint to deport illegal Bangladeshis in Assam". Hindustan Times. 10 December 2014. Retrieved 25 August 2015. ^ "Illegal immigration from Bangladesh a national problem". India Today. 4 June 2014. Retrieved 25 August 2015. ^ "Leave in 15 days, BJP MPs tell illegal immigrants in Assam". Firstpost. 2 June 2014. Retrieved 25 August 2015. ^ Government of Assam. "Economic Survey of Assam 2001–2002 in Assam Human Development Report, 2003". p. 32. Archived from the original (PDF) on 20 February 2007. Retrieved 6 June 2007. ^ FAO Statistics Division, 2007, Food and Agriculture Organization of the United Nations. "Faostat". Archived from the original (– Scholar search) on 11 February 2007. Retrieved 5 June 2006. ^ Assam Small Farmers' Agri-business Consortium. "Fish Species of Assam" (PDF). Archived from the original (PDF) on 14 May 2006. Retrieved 5 June 2006. ^ "Assam Flood Toll Rises to 13". NDTV. 23 August 2015. Retrieved 25 August 2015. ^ "Flood situation in Assam worsens". Hindustan Times. 23 August 2015. Retrieved 25 August 2015. ^ "Indian state: Assam". Ministry of External Affairs, Government of India. Retrieved 1 August 2013. ^ "Indian state: Assam, Thrust Areas". Ministry of External Affairs, Govt. of India. ^ "GMC". Guwahati Municipal Corporation. Archived from the original on 4 November 2013. ^ "Dibrugarh Municipality". Dibrugarh Municipal Board. Archived from the original on 1 September 2014. ^ "New Delhi Dibrugarh Trains". Indiarailinfo. ^ "Trains from Dibrugarh". Indiarailinfo. ^ "ADB $200 Million Loan to Upgrade Services in Key Cities of India's Assam State". Asian Development Bank. ^ "$81-million ADB loan for State urban infrastructure". The Assam Tribune. Archived from the original on 3 November 2013. Retrieved 1 August 2013. ^ Government of Assam (18 February 2007). "Available Resources in Assam". Government of Assam. Archived from the original on 16 July 2011. Retrieved 18 July 2010. ^ "Assamco". assamco.com. Retrieved 22 September 2012. ^ "Government of Assam | Department of Industries and Commerce". Investinassam.com. Archived from the original on 16 March 2012. Retrieved 22 September 2012. ^ "Assam Economy – Economy of Assam, Business & Economy of Assam India". iloveindia.com. Archived from the original on 10 July 2010. Retrieved 18 July 2010. ^ "Dances Of Assam - Folk Dances of Assam, Traditional Dances of Assam". www.bharatonline.com. Retrieved 20 June 2018. ^ "khorisa turns natural preservative". ^ Assam Tourism 2002, Government of Assam. "Arts and Crafts of Assam in About Assam". Archived from the original on 7 April 2007. Retrieved 3 June 2007. National Commission for Women (2004), Situational Analysis of Women in Assam (PDF), archived from the original (PDF) on 15 June 2007, retrieved 5 July 2006. Gait, Edward Albert 1863–1950 (1926), A History of Assam, Calcutta: Thacker, Spink & Co.
Hunter, William Wilson 1840–1900 (1879), A Statistical Account of Assam, London: Trubner & Co.